If your backyard is looking a little tired, unused and sad it may be time for you to think about installing some outdoor decking. A deck serves so many purposes; it is a place to share meals, to entertain, to relax. And, on top of all of that, it’s also a fantastic way to add value to your home by turning a wasted space into a multi-functional space. Everlast Services has been installing outdoor decks for over 20 years. We have an impressive folio of happy customers and incredible deck designs and installations. We always ensure that our constructions are strong, weather proof and that our wood is taken from sustainable sources. Decks are a real passion of ours. We have a select team of master craftsman who know how to turn lengths of timber into an incredible outdoor space. Our time in the industry has given us experience with all sorts of backyards, no matter how tricky you think your space is we’ve got a solution for you. 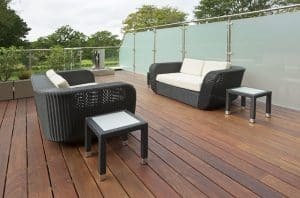 Why Everlast for Your Outdoor Decking? If you’re passionate about supporting the local economy, then Everlast Services is for you. We are 100% Australian owned and operated and always will be. On top of that we go to great lengths to support local business by sourcing as many of our products and materials from our neighbours as possible. We also have our own steel fabrication plant in Hoppers Crossing and we’re proud of the jobs we’ve create there and the work that our team does. Our excellent service and quality workmanship comes at an affordable price. The excellent relationships we have with local suppliers means we can get high quality materials for a fraction of the cost and we deduct these savings from the quote every time. Our history is a testament to our success. We have been in the industry for over 20 years – you don’t last that long unless you’re doing something right. Our name is built on care for our customers and pride in our work and anyone that pulls on an Everlast shirt exhibits these qualities. If you want to team your outdoor decking project with a full backyard renovation you’ve come to the right place. We offer a range of landscaping services from pergolas to veggie gardens and even pool fencing installation we’ve got your landscaping needs covered.